«©NCSX» Whereas the Batman is straight-laced and numbingly sober, the Joker is loosey-goosey. If he were candy, he'd be two packs of Twizzler. Jokey doesn't need libations to get the party started and you can always count on the former Arkham inmate to sport a big red smile. Medicom's upcoming Joker Kubrick measures 7cm or 2.75" in height and is dressed in a green vest that's covered by a purple trench coat. Thick eye shadow gives his face the raccoon look that Goth girls strive for while bright green hair provides a vibrant contrast to Joker's pallid complexion. 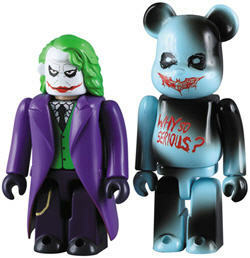 The Joker Kubrick figure is accompanied by a ghastly Bearbrick with a bloody smile and a body that's charred in select spots. The words, "Why So Serious" are etched across its chest in jagged red letters. In the Dark Knight movie, the Joker recounts a story from his childhood where his father says those words to him before performing minor surgery.